Two brothers, accompanied by two young Kenyans, spent the 8th to 20th of last November in Rwanda for a new stage towards the pilgrimage of trust on earth to be held in Kigali from November 14th to 18th 2012. This visit consisted firstly of some time spent in visiting parish officials and youth chaplains to introduce them to the preparations for next year’s meeting and to fix some dates with some of the young people likely to take part. 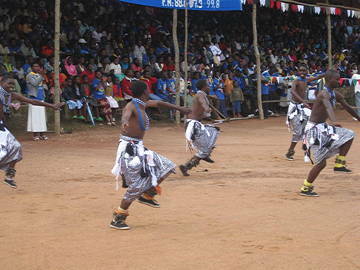 At the same time, it was necessary to ask for their help in preparing this large international and ecumenical meeting, and to reassure those who, in facing such a new challenge, might worry or construct all sorts of strategies designed to assure the success of the venture… Each meeting makes it possible to discover other facets of the lives of the communities being visited. 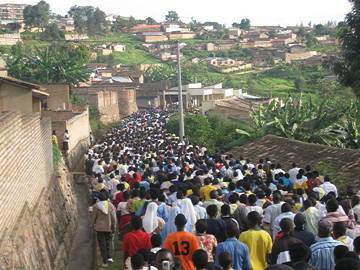 “After their confirmation, the young people disappear: the boys go to the wolfram mine and waste the money they earn. Your suggestion of a meeting could help me to mobilise them.” Ordained just six months ago, Father Emmanuel doesn’t hide the difficulty of meeting up with the young people of Shyorongi, a half hour’s journey from the city centre of Kigali. 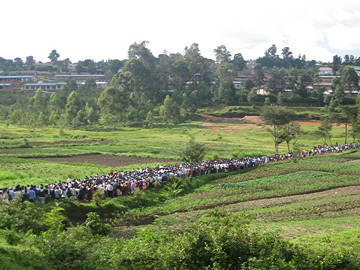 Nyamatta, a half hour’s journey south of Kigali, will also be asked to offer hospitality. In this district, 33,000 victims of the genocide were listed. This parish church has been requisitioned to preserve the memory of the victims. As in many other localities, at the start of the troubles it was to the church that people ran for shelter. In the early crises, lives had been saved in this way. But this time the killers’ violence didn’t stop at the church doors. They blew up the iron grilles and machine gunned everyone. The tabernacle is in bits; the roof and walls are riddled with bullet holes. They have laid out on the benches the still earthy clothes of the exhumed victims. To one side, two underground ossuaries in the hypogeum are open to visitors. After morning prayer with the staff, Reverend Eliseé Musemakweli, president of the Protestant Church of Rwanda, welcomes us warmly and commits himself to involving the country’s pastors in the project. “It will be good if the Minister of Youth or other representatives of the authorities are present. Those in charge need to understand that young people have this interest in the faith, and that they see the role of the Churches,” he remarks. 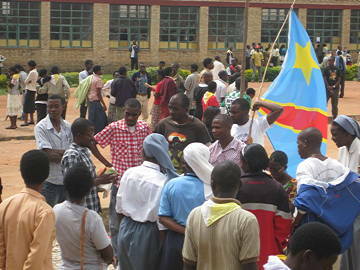 A second part of the visit was participating in the national forum of young Catholics of Rwanda, which took place this year in Kabgayi, from November 16th to 20th. Four days of celebrations, of talks, of meetings bringing together two thousand young people with bishops and around sixty chaplains. Representatives from Congo, Burundi, Tanzania, and - a first time, this year – four Kenyans, joined together there. The brothers were invited to animate the Way of the Cross which led those taking part to criss-cross the town for three hours and to give witness there to the vigour of their faith. 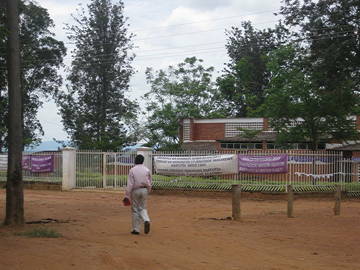 Rwanda remains profoundly marked by the genocide of 1994. Almost ten per cent of the population disappeared in this. Many families lost numerous members. Those responsible for this country are animated by an audacious vision and a great ambition. They gladly take the visitors as witnesses by introducing them to the enormous road and work of reconstruction accomplished since 1994. If the memory of having been abandoned by the international community remains an open wound, there is also an immense thirst for recognition. Far from representing a step that is easy and goes without saying, an invitation to a pilgrimage of trust is something that questions people deeply. Along with the organisational challenges of preparing a gathering of several thousand people, what is at stake is to be truly able to make people available and to set them off one with another, one towards another. It is in beginning with ourselves that our invitation has a chance of being understood and taken seriously. Beyond the memory of the drama and gratitude for the road travelled, we hope to discover and celebrate the source of the courage and audacity which has fed those who have set out on a road of peace, reconciliation, and forgiveness.